The Wallace bat is numbered /20 but it was damaged in the top middle of the bat during shipping. Boo... stupid USPS, they mangled the bubble mailer pretty bad. I now have the Pena /35 and this one is /50. Don't know if I'll hunt any of the lowered number ones. I'm curious when he signed these and if he did so while on a plane, they are rather shaky looking. 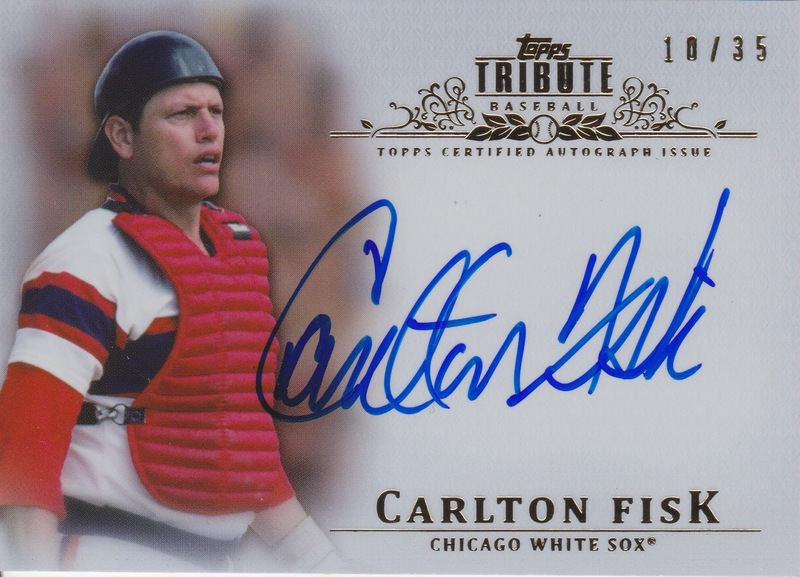 I tweeted about it when it first came out and FieldLevelView said his Tristar signing was very similar, shaky... his playing days autos were very smooth. Odd. 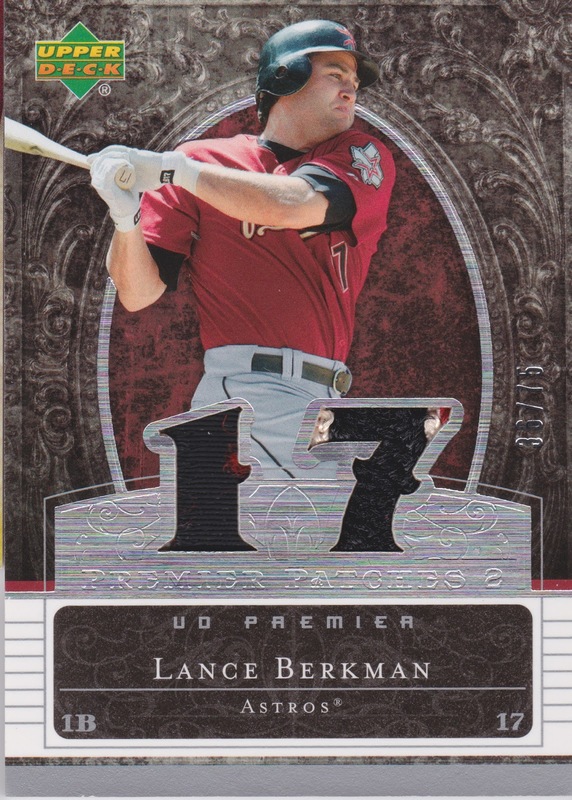 Anyways, a SWEET looking card nonetheless. Next up, we have a redemption update... 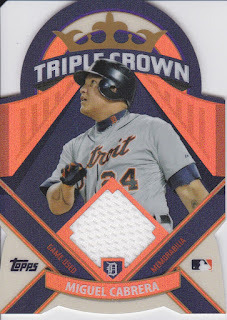 I managed to pull one of the Triple Crown Miguel Cabrera redemptions and it finally came in the mail today. It was worth the wait! This card is even more impressive in person! Die cut and shiny!!!! I love it, great looking card. Finally a trade with blogger Dustin of Coot Veal and the Vealtones. He responded to my post saying that I had updated my trade bait and keepers files. We hammered out a trade pretty quickly. 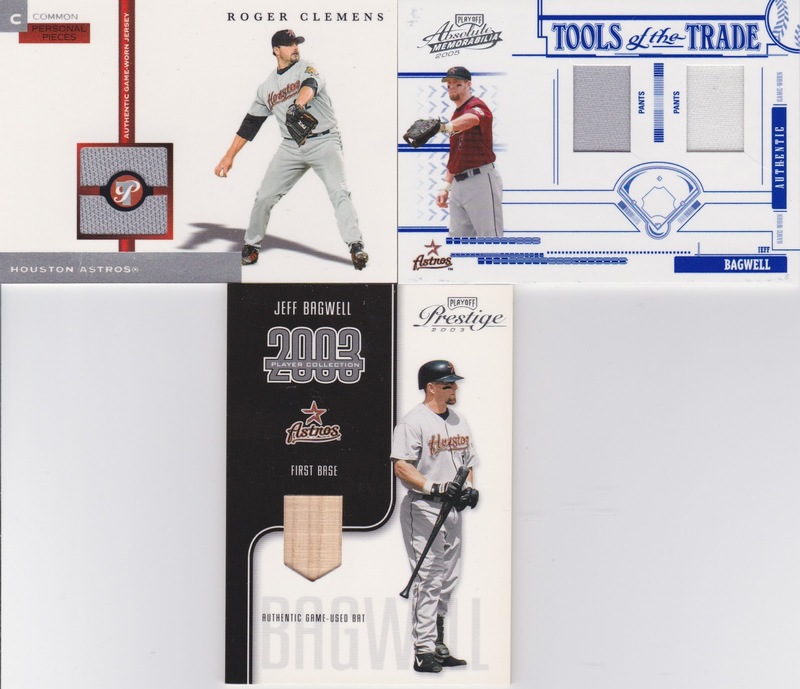 I love getting new Bagwell cards! 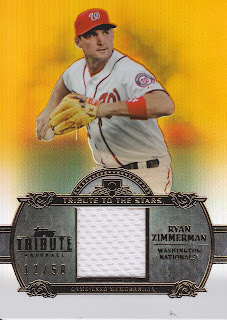 His is my one "superstar" PC that is really starting to lag behind because Topps is ignoring him even more than usual. He needs a card in Museum Collection, Archives or GQ. 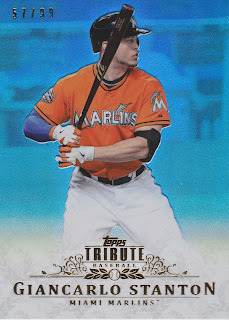 Seriously, Topps how do I make this happen?!?!?! Thanks Dustin! 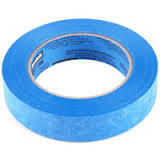 That's blue masking tape. Advantages: EASY TO SEE, JUST AS EFFECTIVE AS PACKING TAPE, EASY TO REMOVE and best of all: NO RESIDUE. Seriously people, it's a worthwhile investment. Easily found at most hardware and office supply stores. Even the regular white/yellow masking tape is an upgrade over packing tape. 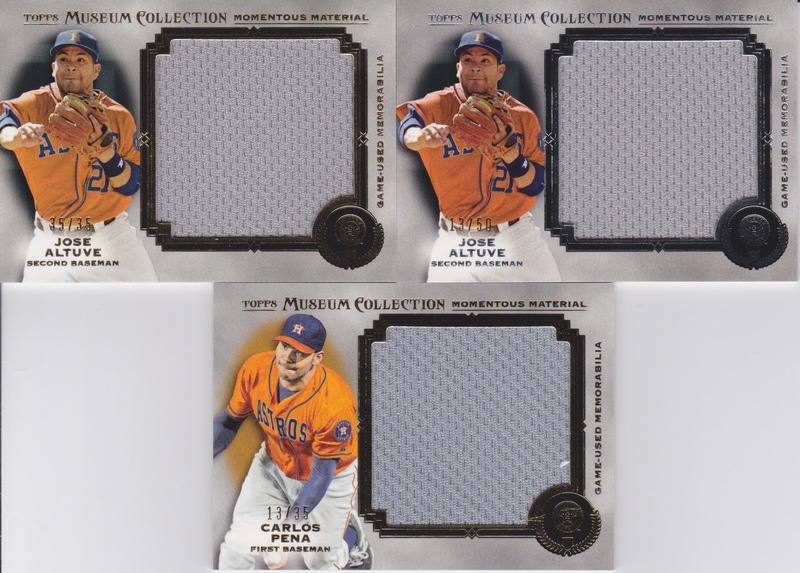 The first Altuve is #'ed 35/35 and on the right, 13/50. The Pena is 13/35. Nice looking jumbo swatches. 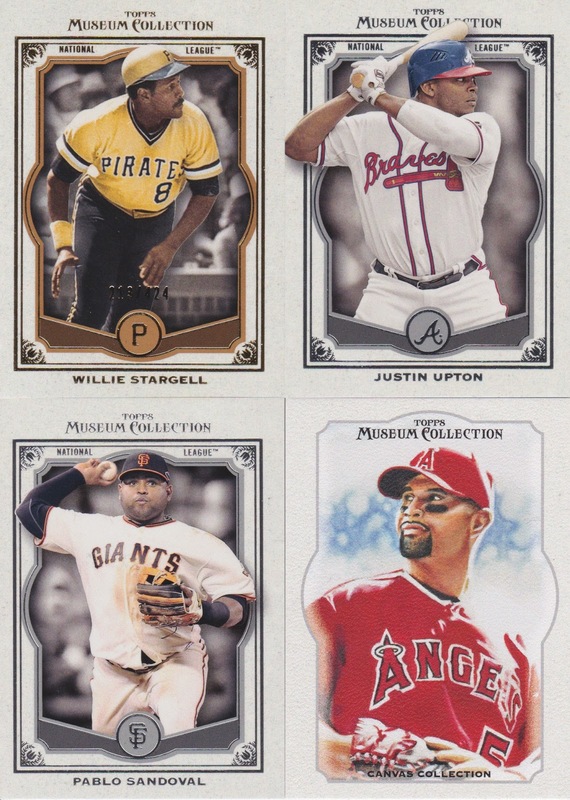 The Stargell parallel looks pretty nice. And the Canvas Collection's are pretty sweet too... I bought one pack just to try it out and the hit was a Todd Fraizer auto out of /399. Seriously, same cost as Tribute with higher serial numbered base autos and worse looking base cards... yea, give me Tribute any day. Just wanted everyone to know, I have done a massive update to both my "Keepers List" that I link the side bar, as well as my "For Trade" photobucket if anyone is looking to trade. I've picked up quite a bit lately and hopefully you find something you want in there! BISON!!!!! Greg over at Plaschke, They Sweater is Argyle got a picture of this via Facebook messenger within an hour of this being pulled. 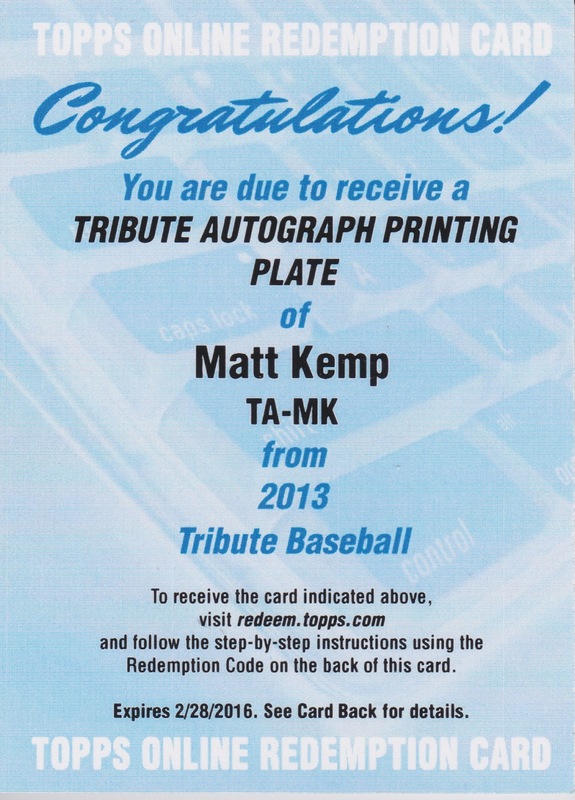 I finally decided this was better than the Chipper because it is a 1/1 and it is autographed. I'm hooked on Tribute. We went by Target yesterday to grab some stuff, and I found myself starring at the card aisle with no desire to bust ANY of it. I walked away happy having not spent $20 on stuff that I don't want. 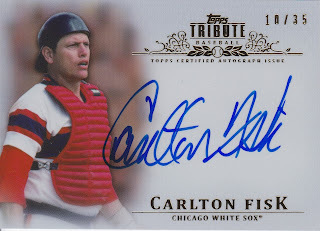 I love busting Tribute, so from here forward it may be a matter of me saving up for packs or a box of the stuff. Should lead to some nice trade bait for all of you guys and girls, as there's little of it I'll keep for PC reasons. Anyways, all the cards you've seen in the countdown are FOR TRADE and all are unspoken for... I had a Facebook trader offer me $0.50 on the dollar for about half of these cards and this was the second time he'd done it, so I told him to bugger off and I'll find someone who actually wants to trade me decent value for them. 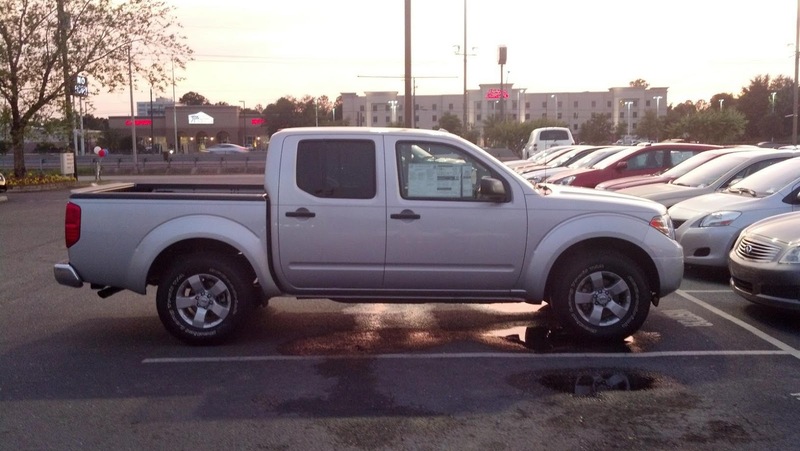 That's a 2013 Nissan Frontier Crew Cab. I've desperately wanted a truck for a long time and we were in a position to do it without a change to our budget (due to other bills being paid off recently). The Hotwit and I have an awesome new ride! 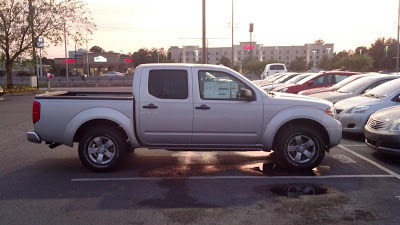 It's silver and came with a sweet "value package" that included a spray-in bed liner, utili-track hardware, towing package, rear-view camera, XM and all kinds of goodies... we may be going for a ride today! 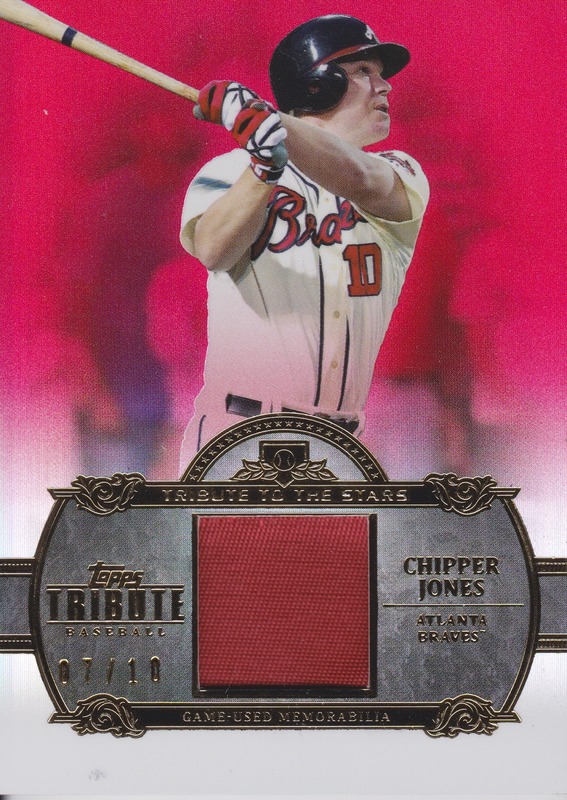 Tribute to the Stars ---- Chipper Jones ---- PATCH!!!! This card is extra thick, when I opened the box I could immediately tell that one pack was MUCH thicker than the rest, and I was hoping for a book card, but I'm VERY happy with this one. The red background makes this card pop! Awesome! There isn't anything about this card that I don't like. Awesome, awesome, awesome. #'d out of just 10 (his uniform number, eh?) this thing is just beautiful. I keep debating whether to sell/trade it or keep it. 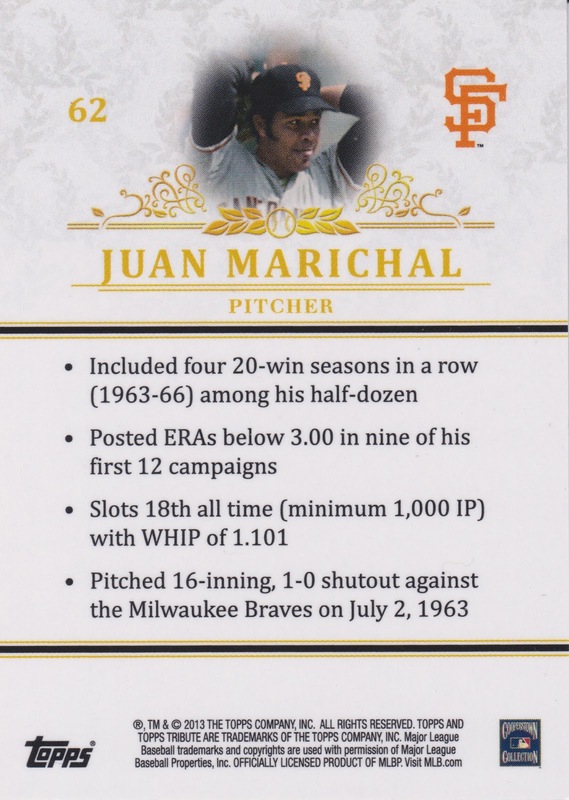 It doesn't fit any of my PC, but he's a great player and this is an awesome card. 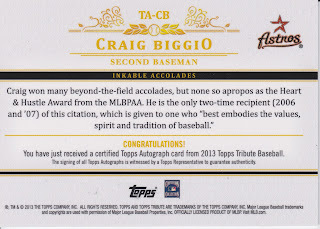 This is a orange parallel auto /25 (whereas the Fisk was sepia out of /35). That's a very young Don Mattingly. 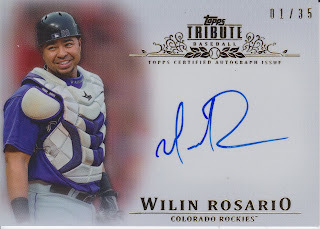 Another great auto from my series of packs. I'm sure there may be a Yankees fan or two out there who might want to get their hands on this one. 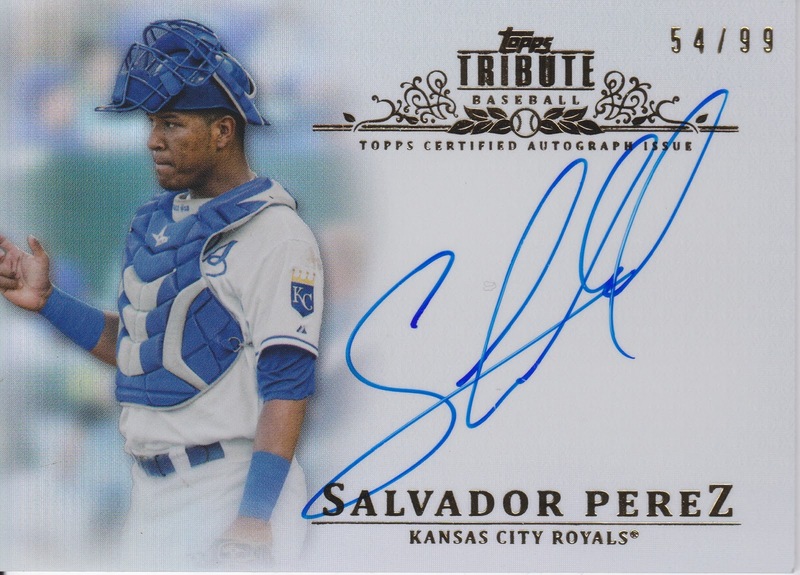 I really like the design of the autograph cards in this year's set. A decent photo area, a designated place to sign the card and clear numbering on the front of the card. Simple, yet effective. 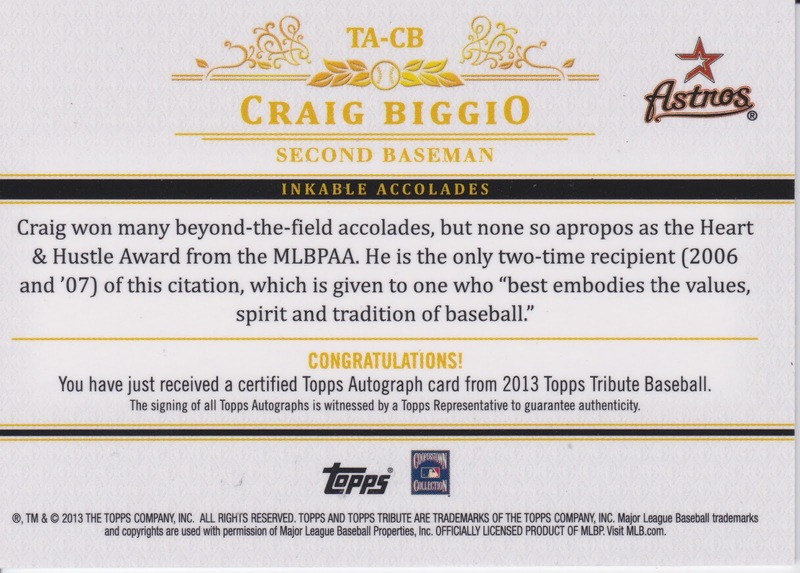 Now Topps, I know you troll my blog, that WAS a compliment. I don't hate you entirely. I was really excited about this next one when I pulled it. 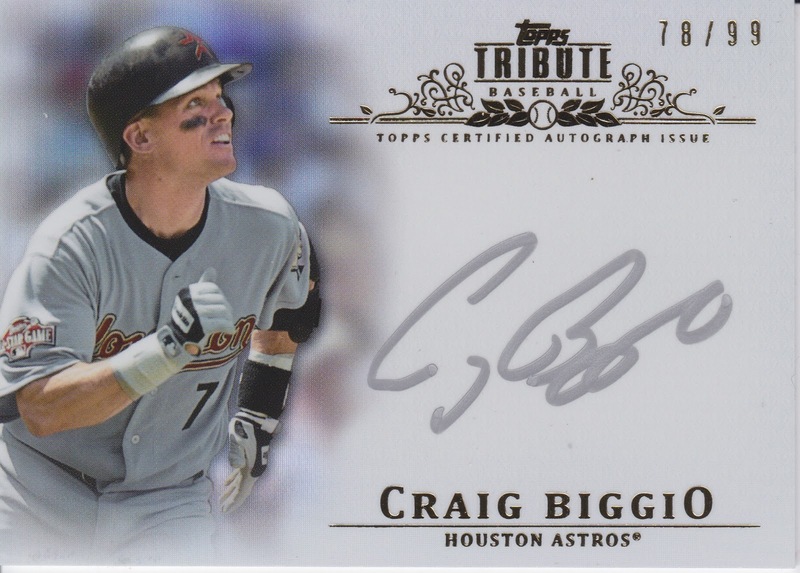 For some reason as a kid, I really was a fan of this guy even though he wasn't on the Astros. There was just something about the way he played... plus I thought it was interesting how he jumped back and forth between the White Sox and Red Sox. 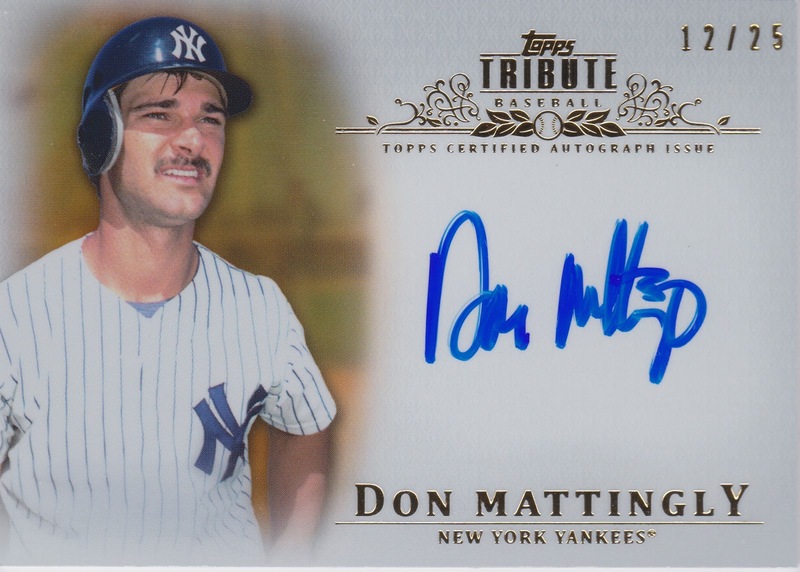 Without further ado, a HOF'er autograph numbered 10/35! How awesome of an autograph is that?!?!?!? You can read the whole name! 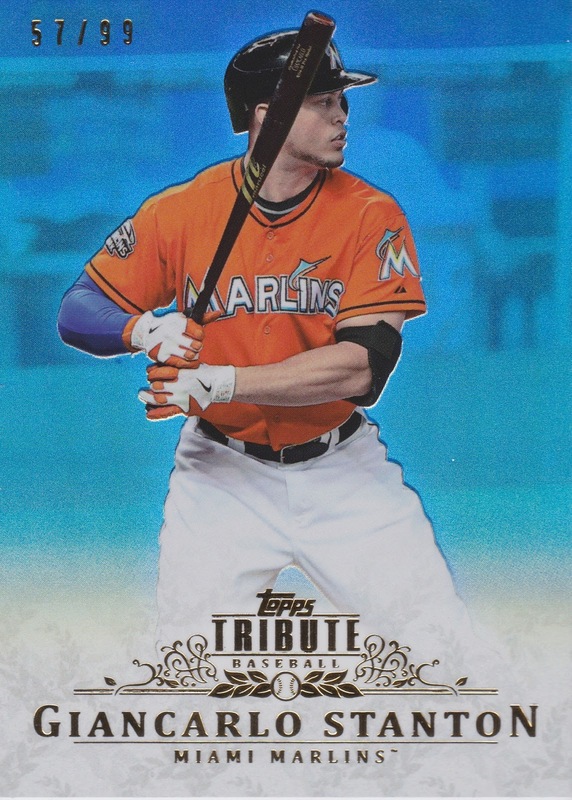 That picture is pretty cool too, I'd have preferred this to be a Red Sox card actually, but it still looks cool. I love the old style chest protector and the backwards helmet headgear. You just know he's standing there about to start barking out orders to his infield with the glove on one hand, and holding the mask in his other. Love this card! 1/1! A true 1/1!!!! Not some eBay "the serial number is the square root of his high school uniform number!!!" 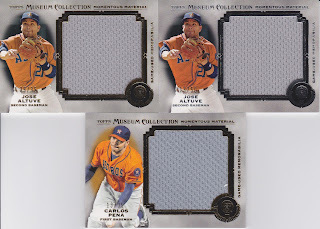 1/1... a printing plate. I should have scanned in the back of the card but it's done the same way as the base card. Very cool. 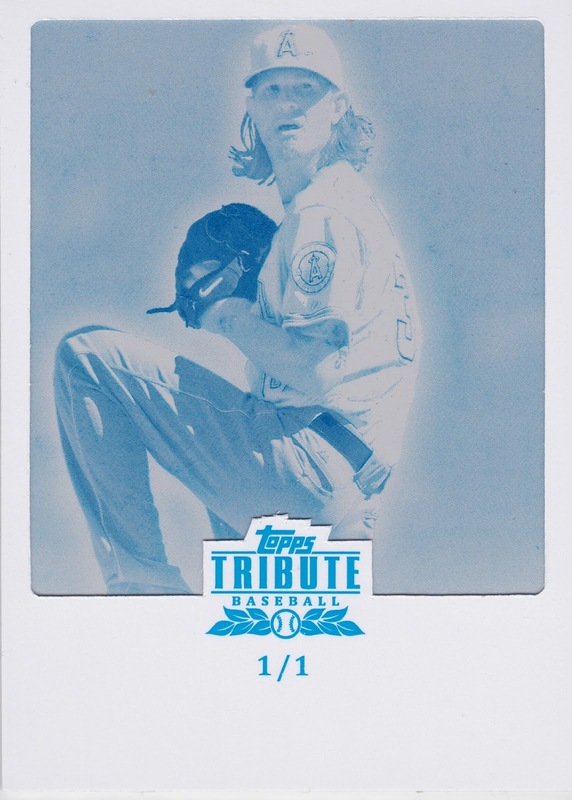 The way it looks to me because of the way the printing plate is, there looks to be a sort of aura around Jered. If only he'd start pitching again this season! What a design! Retired Remnants... Billy Williams bat relic... awesome looking card, great photo and numbered out of /99. 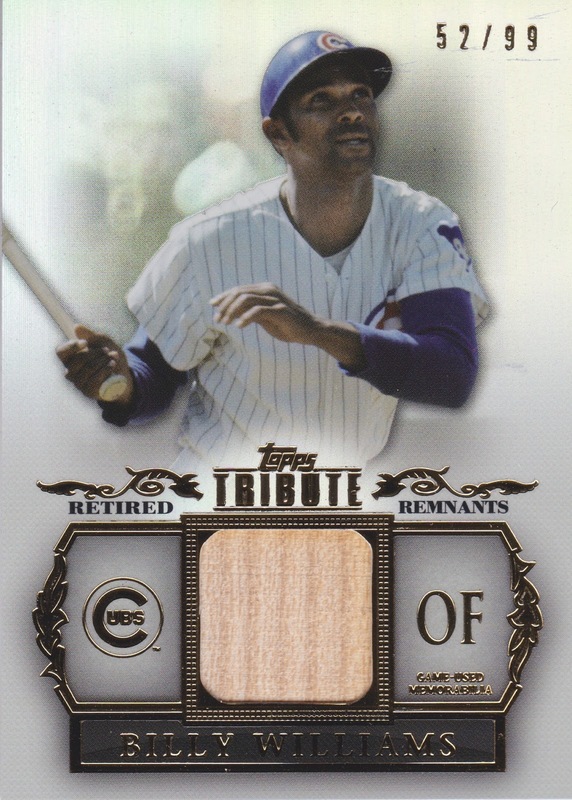 I don't know if there is a blue parallel but if there is, I'm sure it'd look even more awesome than this one for all you Cubs fans out there. Alright, we enter the top 5 tomorrow... It gets a little bit more awesome each day! A nice buyback of a guy I never heard of, a crazy looking refractor of Arian Foster, and a purple parallel of a Bowman prospect who the Astros released earlier this year! Haha! Ok, so I had some fun with that but those are awesome cards! The meat of the deal... a SWEEEEEEEEEEEEEET Berkman patch!!!! 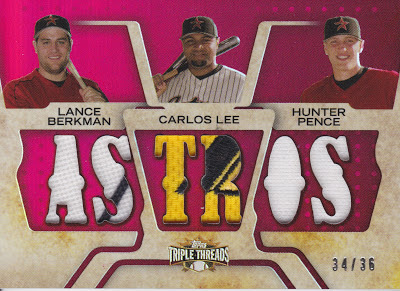 If only I could train my scanner to ignore Carlos Lee! Haha! Ok, so I think that Lee swatch is from an All-Star or WBC jersey, but that's definitely part of the Majestic logo! 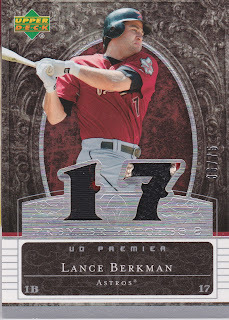 The Pence relic is kind of blah, but the Berkman has a nice pin-stripe! Thanks Greg for another great trade!!! I don't care if it doesn't fit right on the webpage... this thing is ridiculously awesome and it's going to be on "X-Large" setting. 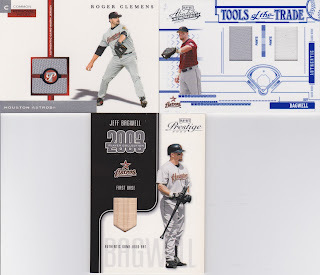 Ryan, Pettitte, Clemens, Oswalt, Berkman and Biggio???? Two patches???? Some rainbow Nolan love???? I picked this up for less than the LOW Beckett book value! Ridiculous! I am super pumped that this is my first book card and such great subjects! I am really surprised the guy accepted my offer, but I'm SOOOOO glad he did. Thanks for stopping by everyone!!!! Wow, #'ed 17/50, this is one awesome looking relic. "Tribute To The Stars" This is how you do it Topps. There isn't anything about this card that I don't like. It doesn't have a place in my keeper collection but still, it's a great card! 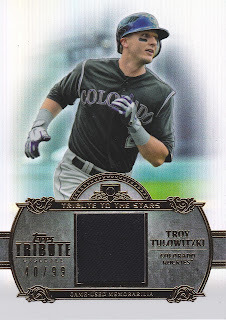 I have posted a want list for Tribute base cards if any of you guys have opened any and are looking to make a trade, I also have a list of cards for trade as well. 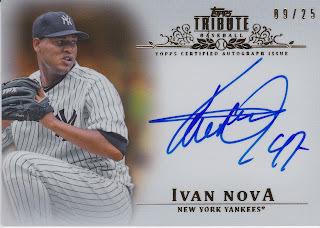 What a nice auto, right? It's semi-legible and it's more than just a couple letters scribbled across a card. Not too shabby. So, trade night happened tonight at BigHit Sportscards. It was a crazy night as it was their 5th anniversary of being open. I ended up spending my allotment for May and June in order to try and win the big prize: a Michael Jordan autographed jersey. I will spoil the anticipation, I did not win. 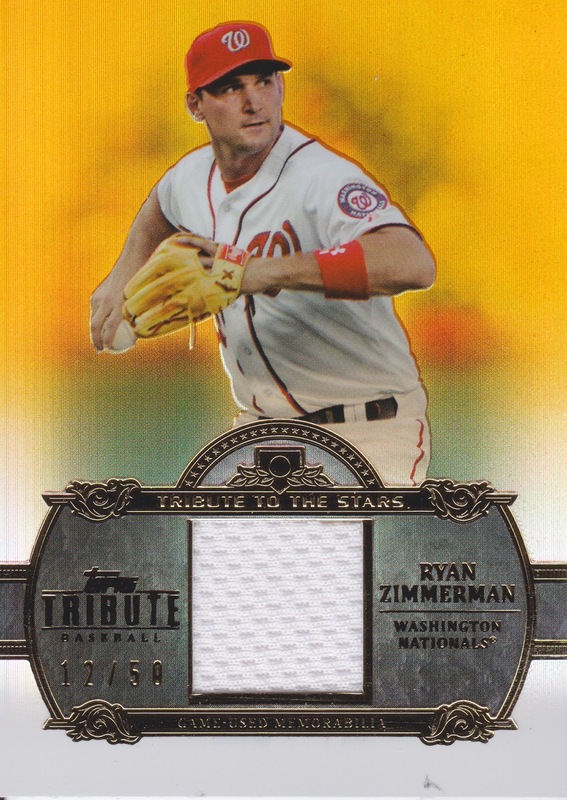 But I did find out that I LOVE opening Topps Tribute. These cards are ridiculously nice and while there are pros and cons to all products, I like the overall box quality... I bought enough that I'm not going to do a countdown like I did with the other two packs. Ha! Two packs? Yea, I totally went overboard this month on Tribute. But I'm pretty happy with my loot... 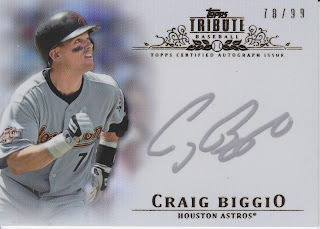 I didn't get any additional Biggio autos, shucks, but I did end up with some pretty sweet cards. Not counting duplicates, I'm about a third of the way to the complete base set. I think I may chase this complete set, so if you've got any to trade I'd love to make a deal! I will be adding a want list to the side bar soon, but if you want to tell me what numbers you have, I can let you know if I need them. I will also post what duplicates I have as well! Oh Ivan Nova... if you were on any other team, you'd be just another guy on a roster. 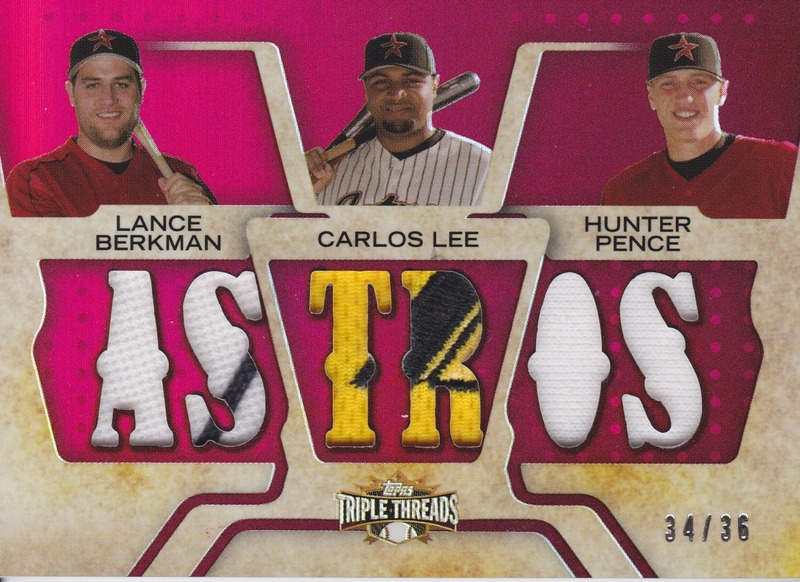 Seriously, put Lucas Harrell or Bud Norris on this card and you're in the same realm... but no, Topps doesn't think Astros collectors exist. Alright, if an autograph #'ed out of 25 is the 11th worst, then you know I got some pretty good stuff. 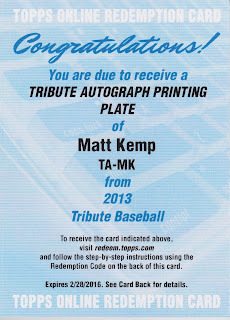 There is one collector out in the blog-o-sphere who knows the #1 card as I sent him a pic via Facebook. Please, no spoilers, you know who you are! 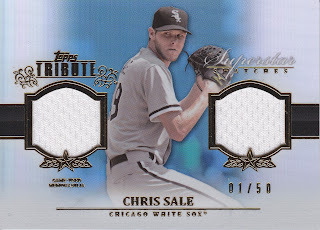 Chris Sale! Nice! And numbered #1 out of 50!!!! eBay 1of1!!!!! WOO HOO!!! Haha... anyways, a nice dual swatch of Chris Sale, who may very well challenge for a Cy Young at some point soon. 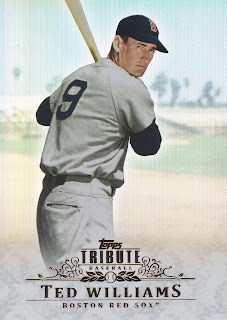 I love the look of this card, the dual relics broken up by a nicely centered action shot. Ok, it's 10:25pm, I'm getting sleepy... more cards coming in the next few days. 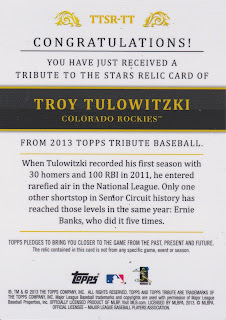 2 Packs of Tribute - Card #1.... and an eBay pickup! 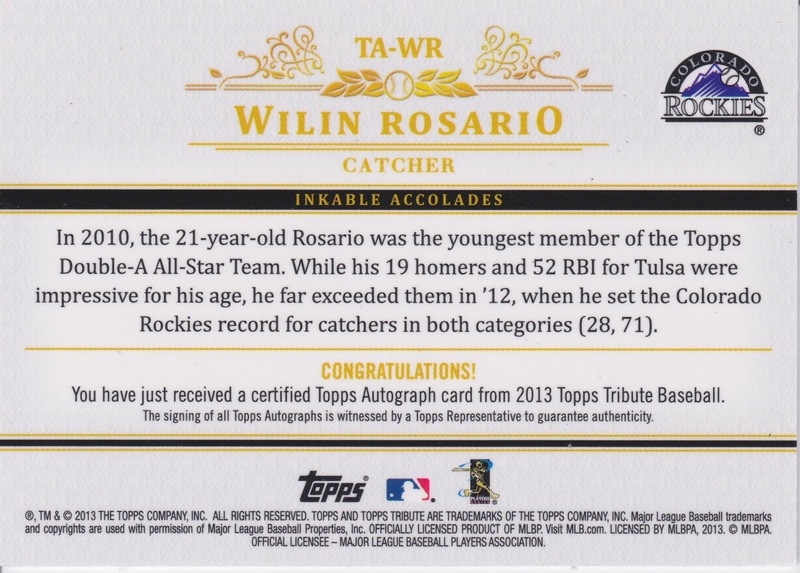 Another "Congratulations"... thanks Topps. Again, all of the cards in this series are for trade (except the Darvish, which has been traded to Mr. Napkin Doon and is in the mail!). I got this for $35 shipped. I was pretty happy with that price. 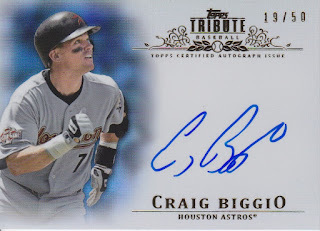 Looking over a lot of the autos, there were quite a few where it looked like Craig signed them on a rather turbulent airplane ride. This one, not so much. So I went for it! 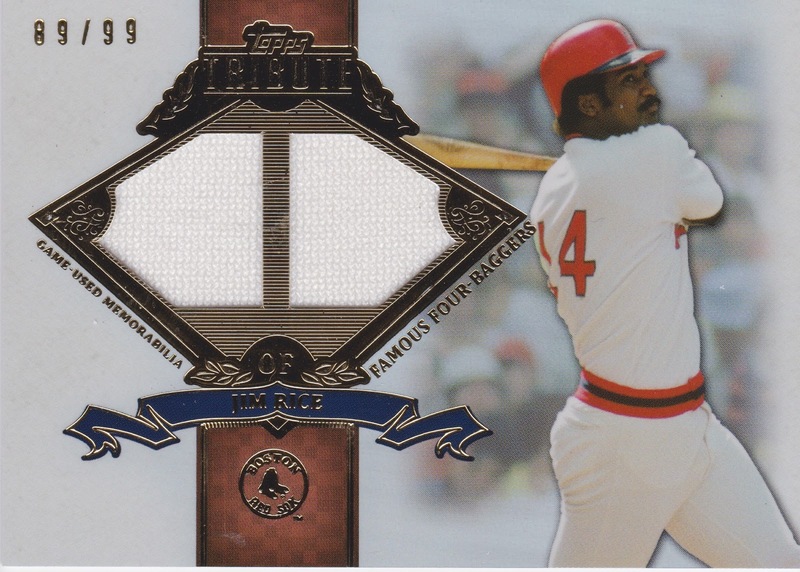 Slick looking card and relic. #'ed out of 99 and it sure did scan well! I've never been a huge Tulo fan but he is the face of the franchise for Colorado right now. 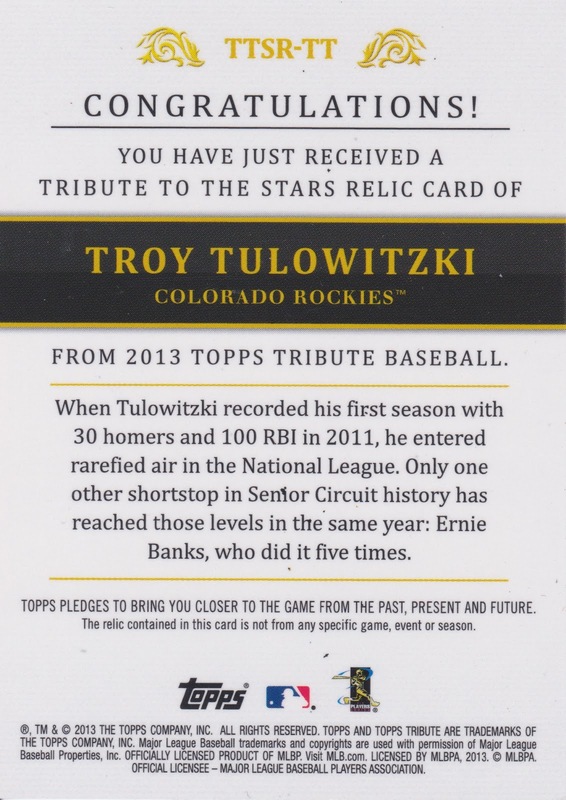 Nice card for those who collect the Rockies! And here's the back! Thank you for the big "Congratulations!" there Topps. Isn't it about time we get rid of that? A bit unnecessary in my opinion. Any time you're drawing comparisons to Ernie Banks, you're doing something right! Tomorrow we'll have my last card from the two packs and you may have guessed by now but it is an autograph! Card #3 of the countdown brings us a parallel. I pulled a green/emerald parallel and I think it looks pretty cool. It's numbered 71/75. 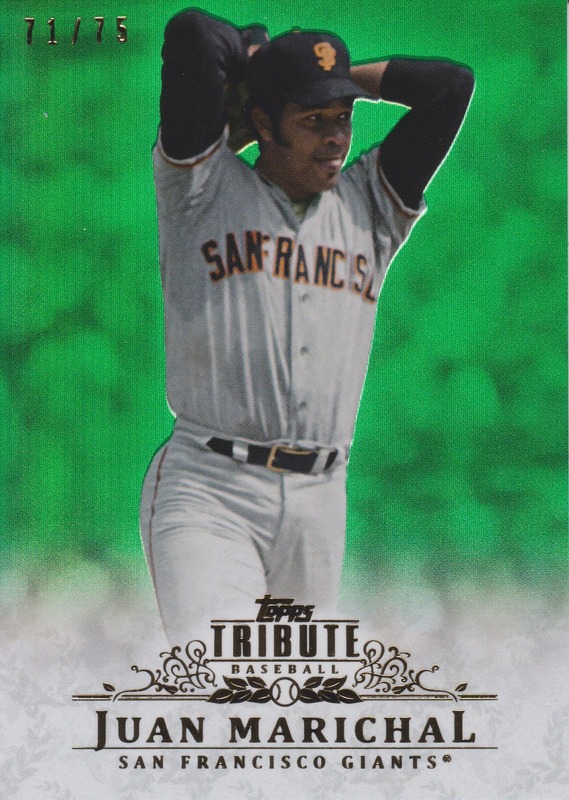 There is something about the way Marichal stands out against that green back ground that just looks awesome. Marichal is one of those guys who was great in his time, deserved the HOF and yet kind of blends into the background. I went and looked up his stats and while he may not have won 300 games, he was dang good. 244 career COMPLETE GAMES... that's crazy. I doubt we'll see another player EVER who gets even close to that. Great looking card! This man's death did not do justice to his life. Baseball legend and national hero. 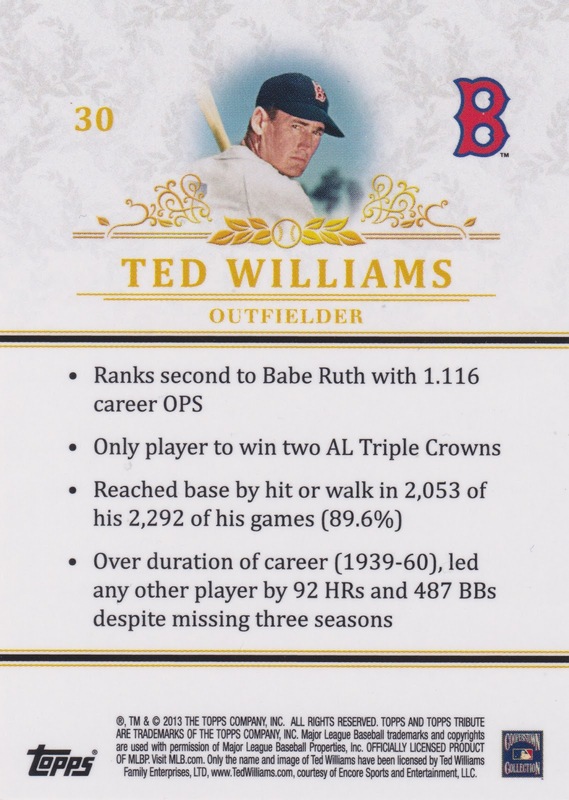 This is one great looking card, I can't imaging what it would be like as a rookie pitcher having to stare this man down in the batters box. 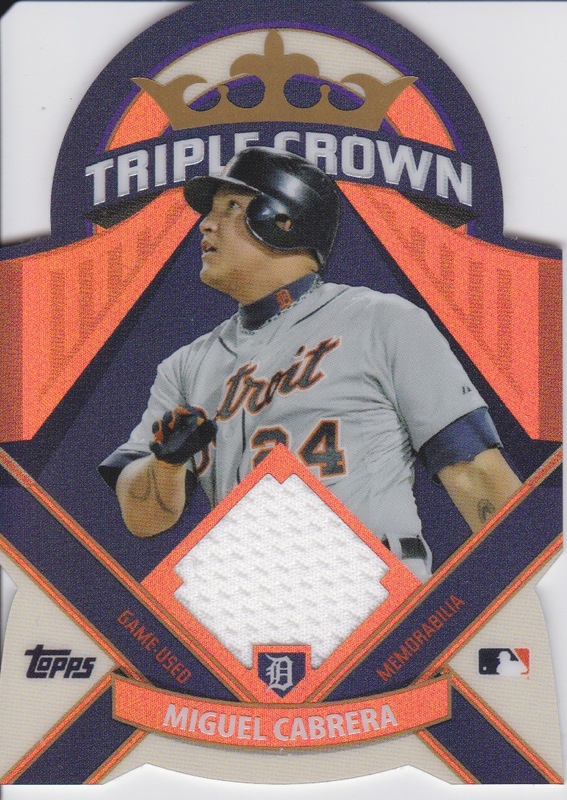 Two triple crowns? Reached base in some manner in 89.6% of games played? Ridiculous. Missed three seasons to serve his country and still outhit every other player in the league. Great info on the back of the card! 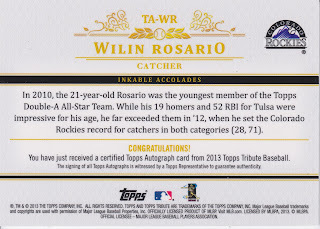 Well, that's the last of the base cards... we have one parallel and two hits left!